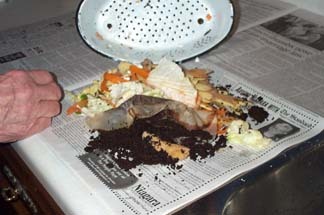 It was only a couple of years ago (well, O.K., maybe fifty years ago) that our kitchen waste consisted mostly of organic materials that could be composted. As of April 2004 residents of the Region of Niagara will be dealing with this material in a more responsible manner in order to reduce the load on the regional dumps. This page is intended to show how we dealt with this sort of garbage material in the past without the use of disposable plastic bags. with updated instructions for the 21st century. 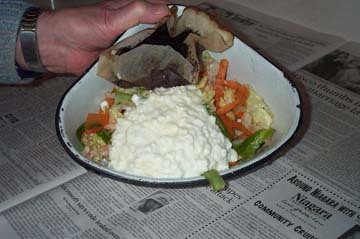 click a list of "organics"
Cellophane, plastic and other "non edible" waste does NOT go here! 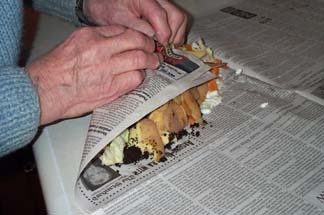 The waste is then dumped on two sheets of old newspaper and rolled up. 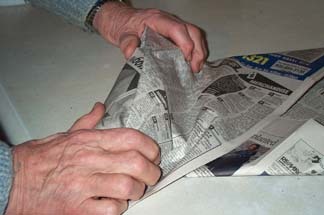 "You may also wrap your organics in paper and place them directly into the kitchen container . . .."
Please visit the Niagara Region Web Site for details. 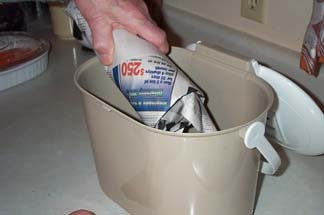 The rolled up garbage is placed in the convenient kitchen container. 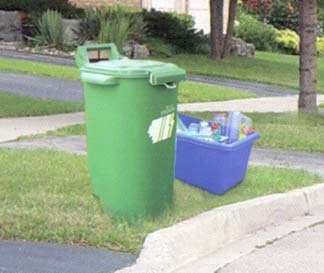 Garbage is transferred from the convenient kitchen container to the curbside organics container or "green bin" and placed at the curb on garbage collection day. Thanks to Robert G. Sewell for help in preparing this page. featuring a "pop up ad control"
Click on the icon for details.